This is a universal 100-240 VAC 50/60 Hz power supply for use with Ace Camera Link cameras. Output is up to 2.0 A at 12 VDC. One side has an IEC 60320 C14 "PC type" receptacle. The other side has a cord with a Binder M5 4-pin plug for connection to the camera's auxillary receptacle. 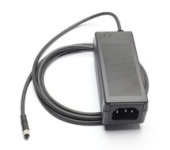 A 120 VAC power cord with NEMA 5-15 (North American) plug is included.